All of the buttons below will take you to the new Kandoo Equine site. Here you will find subscription options to suit your needs, currently available at special introductory prices. This monthly subscription gives you access to the complete Kandoo Club online training system. Watch videos, download lesson plans and make real changes in your horse, all in your own time. This yearly subscription gives you access to the complete Kandoo Club online training system. 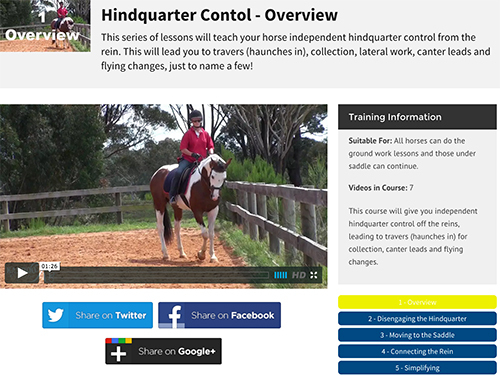 Watch videos, download lesson plans and make real changes in your horse, all in your own time. This is not a subscription and gives access to the complete Kandoo Club online training system for one month so that you can 'get a feel' for the Club. Watch videos, download lesson plans and make real changes in your horse, while deciding on whether the Kandoo Club is for you. If you want to ride a horse that is in-frame, light in the bridle, concentrating on you, confident, not shying and building all those muscles that it needs to carry you, then this is the place to start. The most important foundation training DVD, Give to the Bit takes you through this step-by-step, as set out in the accompanying (PDF) lesson plan, will set your horse up for success and performance in your chosen discipline - be it dressage, Western, jumping, eventing, showing, trail riding or just having fun and staying safe. This DVD will give you complete shoulder control while keeping your horse working lightly in the bridle, maintaining self-carriage and travelling in-frame; in fact more shoulder control than you ever imagined possible. If you want to spin, pirouette, do haunch turns or roll-backs or simply want to navigate your way gracefully around a dressage arena, show-jumping course or trail path - this is the place to start. Long-reining is one of the most useful and educational things we can do with the horse. This DVD will teach your horse to travel in-frame, reinforce shoulder elevation and lightness in the bridle, allowing the horse to get his hindquarters underneath him and improve overall performance in all disciplines. Long-reining provides solutions for problems such as poor transitions, running off and bucking. It is also useful when your horse has been out of work for a while and may be 'fresh' or the youngster that needs to build top-line muscle while being educated. When used correctly, with a clear, measurable, educational goal in mind, the round pen is a wonderful training tool. This DVD introduces you to the basics of teaching your horse inside turns, outside turns and come-to-me. The horse can be introduced to negative reinforcement in the round pen - where pressure is released when the horse makes the desired movement. In this lesson you will learn how NOT to chase your horse in the round pen but rather engage him in learning and have fun in the process. This DVD explains the step-by-step process of introducing your horse to the saddle. It is an essential lesson for the unstarted horse and also a great one for horses that have saddling problems such as cold-backed horses, chronic buckers, fearfulness with saddling or won't stand for mounting. Gone are the days where the saddle is put on the horse and he is left to 'buck it out', resulting in possible injury and a host of associated problem behaviours. Give your horse the best possible start by guiding him through the saddling process in a systematic and safe way. Few things are more dangerous or upsetting than a horse that won't load quietly and calmly onto and off the trailer. This DVD will show you how to teach your horse to walk confidently on to the trailer, stand patiently while you do the ramp up and back off slowly and calmly when you arrive at your destination - every time. While this lesson was designed for the particularly difficult/nervous loader, it is a great lesson for any horse that is a little hesitant about the trailer, doesn't stand when on, rushes off or has never been taught to load. Get the entire Foundation Training DVD set and see rapid changes in your horse and your horsemanship. Each lesson is about one hour long, uses many different horses to demonstrate and comes with a printable PDF lesson plan to guide you through the process with ease.